The Keck Northeast Astronomy Consortium comprises astronomy faculty and students at eight small liberal arts colleges and universities in the northeast. Our goals are to promote astronomy research among our students and to foster faculty and student interaction among the eight campuses. We sponsor a student exchange program each summer and a student research symposium each fall. Although originally funded by the W. M. Keck Foundation beginning in 1990, we are now funded by the National Science Foundation, under their Research Experiences for Undergraduates (REU) program. The application process for summer 2019 is closed. The student research symposium in fall 2019 will be at Vassar College on October 4-5. Each summer KNAC faculty host undergraduate research interns, from within and outside of the consortium, as part of our NSF/REU program. 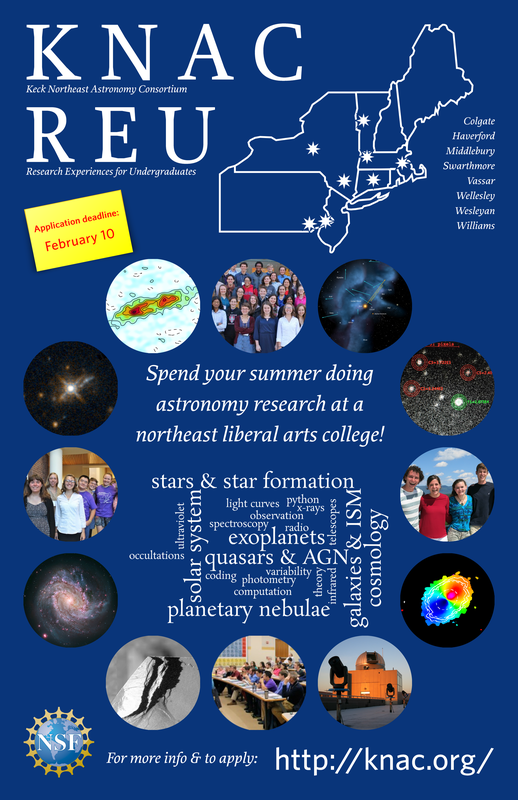 The out-of-consortium spots are intended for students who have few other opportunities for astronomy research participation. Information about the types of research projects carried out in the consortium can be found on the webpages of individual faculty and there's also information available about the application process, though it is now closed for the summer 2019 program. Each fall students and faculty from the REU program and the member schools gather together for a student research symposium. The fall 2018 symposium was held at Middlebury College in Vermont on September 28 and 29. The 2019 symposium will be held at Vassar on October 4 and 5. Information from previous symposia: 2017 Colgate, 2016 Wesleyan, 2015 Williams, 2014 Swarthmore, 2013 Vassar, 2012 Middlebury, 2011 Wellesley, 2010 Colgate, 2009 Swarthmore, 2008 Wesleyan, 2007 Williams, 2006 Vassar, 2005 Middlebury, 2004 Colgate. Our members are active in many fields of astrophysical research. We have a listing of papers published by students under the auspices of our NSF grant. For students writing symposium papers, these guidelines were provided to the 2018 cohort. This material is based in part upon work supported by the National Science Foundation under Grant No. AST-1559865. Any opinions, findings, and conclusions or recommendations expressed in this material are those of the author(s) and do not necessarily reflect the views of the National Science Foundation. Partial support for this work was provided by the U.S. Department of Defense's Awards to Stimulate and Support Undergraduate Research Education (ASSURE) program in collaboration with the National Science Foundation's Research Experiences for Undergraduates program.